The Digital Free Trade Zone (DFTZ) has been described as a window to the world for local SMEs, allowing local products to be sold to the global market. This comes from a joint event organised by the Malaysia External Trade Development Corporation (MATRADE) and the Selangor Information Technology and E-Commerce Council (SITEC), with the event meant to increase awareness among e-merchants about the incentives of joining up with the DFTZ. Yong Kai Ping, Chief Executive of SITEC, started off the event with an introduction of SITEC, going over some of the organisation’s past events and accomplishments. He also shared some advice for the participants present at the event. 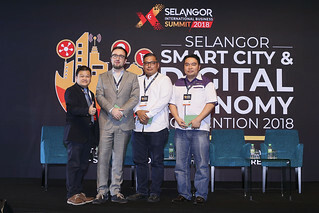 “I assure those feeling unsure about starting e-Commerce or selling overseas that Malaysian products are definitely competitive,” said Yong, providing examples of several brands and products such as durians, Old Town White Coffee, and Julie’s Crackers, all of which are in increasing demand in global markets. The stage was then passed to Adhwa Azmil, assistant manager at the digital trade division of MATRADE, who then spoke about the organisation and explained their eTrade program, an incentive program that helps SMEs to transition to e-Commerce by providing subsidies, advice, and training for SMEs to list on e-marketplaces. “MATRADE is mandated to promote Malaysian enterprises to the world market,” said Adhwa while introducing MATRADE. Following that, Adhwa then spoke to attendees about Alibaba.com, who is the sole strategic partner for the DFTZ. 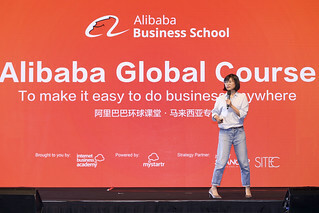 Not only did he mention that the platform outperforms both Amazon and eBay combined, he also provided a case study of a successful local merchant who owns four accounts on Alibaba. 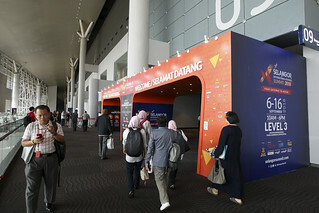 Adhwa then spoke about some of the incentives in place through the partnership with Alibaba, such as how e-merchants will have access to talent trained by Alibaba, as well as how Malaysian products will be featured on the Malaysian Pavilion. In short, Alibaba will be responsible for marketing and platform services through the partnership with the DFTZ. Merchants interested in signing up can head to www.mydftz.com for more information.